Digital display for easy reading, shatterproof, with alarm signaling measurement has ended. Individual plastic case. Forehead thermometer Instant measurement Memory function The Baby Stone by Lanaform is a baby thermometer with a probe which lets you measure baby’s body temperature or monitor baby’s fever. Pacifier with built-in thermometer Fever indicator Memory function Filoo from Lanaform is a baby thermometer in the shape of a pacifier which measures body temperature and checks for fever in babies. The T-40 Digital Thermometer (ref #: TR 200100 ) features a rigid tip. The The T-40F Digital Thermometer (ref #: TR 200200) has a flexible and waterproof 45° tip. Digital thermometer with flexible and waterproof tip taking temperature in 40". The infrared clinical thermometer FTN offers a hygiene, contact-fee, rapid and precise allurement of temperature with diagnosis. Waterproof, with alarm and memory. 32°C - 43°C. More than 200 hours of continuous operation on one battery 1.5 V. Supplied with strong plastic case. 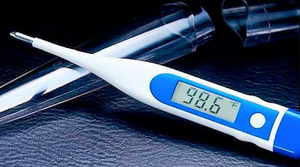 A medical thermometer is used to record and display body temperature. Such measurements may reveal the presence of fever, a common symptom of numerous diseases and infections. Certain thermometers are designed for a specific use. For example, pediatric models may take the form of a pacifier. The measurement may be rectal, tympanic, oral or made under the arm or on the forehead. Certain models have interchangeable tips for multi-location use. There are both mercury and electronic devices. The former are being abandoned because of the toxicity and environmental dangers linked to mercury. The latter use a probe, non-contact infrared waves or another system. Disposable models prevent cross-contamination between patients. Choice will depend on ease of use, instrument precision and reaction time. Another factor is whether the thermometer can be used in one or several locations on the patient. While temperature range varies, most measure between about 35 and 42° C (95-108° F). Patient comfort may determine the choice between flexible and rigid tips.